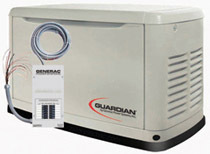 The NEW Guardian 14 kW standby generator provides the cleanest and most affordable pre-wired, pre-packaged power protection for its size. It comes standard with a 14 circuit automatic transfer switch that protects critical circuits in your home. For extra convenience, this model has a digital control panel, external main circuit breaker and system status LED.